How to Protect Your Inner V.I.P. 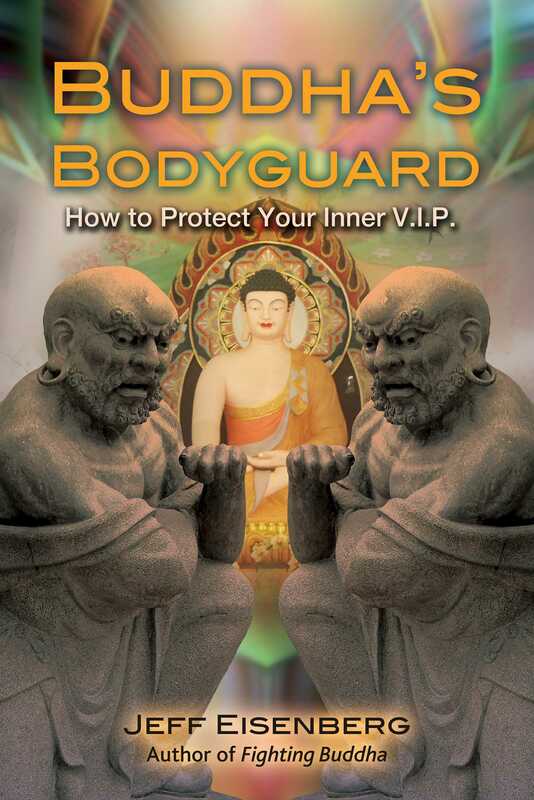 While this book is not about personal protection per se, it applies personal protection theory and specific tactics utilized by bodyguards to Buddhist practice, laying out strategies to protect our inner Buddha from attack. Thus the Four Noble Truths are applied to the concept of “threat” in the form of Four Noble Tactical Truths, the Eight Tactics Plan echoes the Eightfold Path, and the Tactics of Interdepending embrace the notion of Interbeing in the Buddhist world. The second noble truth says that there is a beginning to suffering and that it is attachment. That to bodyguard our inner Buddha, we must understand this fact and be able to identify this starting point. Like the bodyguard responding to a security breach, our ability to see that our mental and emotional security has been threatened or breached usually begins only after the fact that it has been. And just as realizing that there has been a security breach is the first step of being safe and secure, identifying one’s mental and emotional vulnerability is the beginning of eliminating it. People most often come to Buddhism motivated by some sort of crisis, as they look to understand it and to find a way in which to deal with it, not understanding that their realization that there is a crisis, is in fact dealing with it. As a master once said, “people that are looking for spirituality do not realize that they already have it.” Meaning, that they don’t see that the looking itself is what they are looking for, as the desire to pursue a deeper level is a deeper level. For bodyguards the greatest threat is the one that is unidentified, and as I’ve said, more often than not, a threat is not identified until it begins. So since a security breach reveals the beginning of a threat, the first thing a body guard does when a client expresses their concerns about themselves and their family’s safety is to do a security survey. A security survey will help identify the conditions that not only can create a threat, but will expose the vulnerabilities that create the opportunity for security to be breached by the threat. This survey involves getting extremely personal with the client and going over all aspects of their life down to the smallest detail. Schedules, itineraries, activity’s, locations and the routes to and from them, health issues, as well as the status of all their relationships, including family, spouses and significant others both current and former, business associates, friends, employees, care takers, are all closely scrutinized. The client is even pressed to reveal un-flattering information in regards to extramarital affairs and unethical and even illegal activities, as these are often the basis of threat vulnerability. Once identified, these vulnerabilities are secured by altering the client’s interaction with them or eliminating them altogether from the client’s life. In the protection world this is called “hardening the target”. In Buddhist practice we must do the same thing to protect our inner Buddha. We must harden ourselves as targets by doing a survey of our vulnerabilities. We must get extremely personal with ourselves and ask some tough questions about our lives. We must find where our weaknesses lie, and identify what and who are threats to them. Who are the difficult people in our lives? What are the scenarios that accompany our involvement with them? What is the nature of the relationships conditioning? What are the habitual behaviors resulting from that conditioning? What new strategy can be utilized in facing this threat, or should it be avoided entirely? In the protection world whether to face a threat or not is a question that is often asked, as to knowingly enter into a potential threat scenario is decided based upon weighing out whether doing so or not is worth the risk? This might seem like an odd question to have to ask, but many high profile clients have responsibilities that often cannot be left unattended and to do so is nearly impossible regardless if the bodyguard recommends it. Many times protection agents are under-minded by their clients who veto their requests to change schedules, cancel appearances, avoid certain routes, or not engage in spontaneous activity that’s not on the itinerary. The bodyguard is a detail oriented, micro manager that to the best of their ability leaves nothing to chance. While the client is often short sighted, acting on impulse, ignorant of the potential consequences of the chain of events that they are setting in motion, the bodyguard relies on clearly seeing the big picture. Most times, rather than having the luxury to weigh out whether doing something is worth the risk or not, and having the opportunity to avoid it, the bodyguard finds himself having no choice but to engage the risk due to the client’s lack of willingness and cooperation to concede to an alternative plan. If this exists, that exists; if this ceases to exist, that also ceases to exist. The twelve links of the chain of causation explains the workings of dependent origination by detailing the specific causes and effects that act and react to bring things into existence. These teachings go hand in hand with understanding the five aspects of conditionality that I discussed earlier, as understanding the phenomena that we call self and how it’s conditioned mental process works, is imperative to understanding how to end suffering. The first link in the chain is ignorance. The teachings define ignorance as the root of all harm, and explain it as a lack of insight that is the basis of our unwholesome intention. This ignorance leads us to the second link in the chain, which is formation. Formation is the coming together of our intentions, ideas and impulses, which form our harmful thoughts, speech, and actions. This creates the third link in the chain, which is consciousness. Jeff Eisenberg is a Grand Master level martial arts and meditation teacher with over 40 years of training and 25 years of teaching experience. He has run his own Dojo for nearly fifteen years and trained thousands of children and adults in the martial arts. He has also worked as a bodyguard, investigator, and director of crisis response in the emergency and psychiatric ward of a major hospital. Author of the bestselling book Fighting Buddha, he lives in Long Branch, New Jersey.